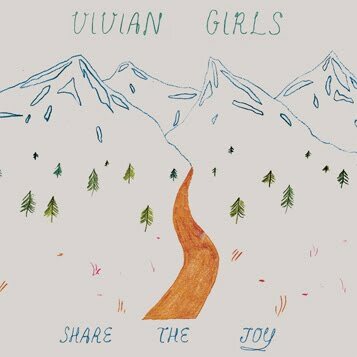 Brooklyn based indie-rockers Vivian Girls have announced details of their new album, ‘Share The Joy’ to be released on 12th April. This is the band's third album, and their first with new drummer Fiona Campbell; former drummer Ali Koehler having left to join Best Coast. To hear how the new line-up is sounding have a listen, below, to excellent new single 'I Heard You Say', available as a free MP3 download at Polyvinyl and at RCRD LBL. While I'm writing about Vivian Girls, it seems like an ideal opportunity to mention reclusive writer, outsider artist and inspiration for the band name; Henry Darger. 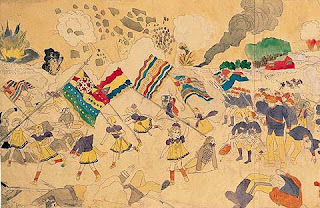 The story of Darger's life and art is truly fascinating, and if you get the chance try to catch Jessica Yu's 2004 documentary 'In the Realms of the Unreal' for more fulsome details than I can include in this short blog piece. 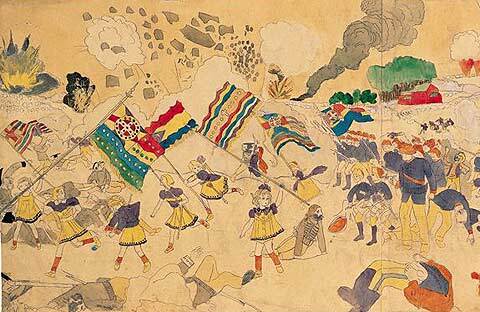 Darger was a reclusive eccentric who led an extraordinary secret life. For over 40 years he lived a solitary existence in a rented room in Chicago, Illinois, completing page after page of densely written manuscripts and self-produced, supplementary, illustrative artwork. These remarkable artworks only came to light posthumously. His most famous work is the 15,145-page, religious-themed, fantasy manuscript 'The Story of the Vivian Girls, in What is known as the Realms of the Unreal, of the Glandeco-Angelinnian War Storm, Caused by the Child Slave Rebellion'. This massive fictional work and the accompanying drawings and watercolour paintings was the product of six decades of obsessional endeavour. The story itself concerns the adventures of the Vivian girls, seven sisters who are princesses of the Christian nation of Abbieannia and who assist a daring rebellion against the evil Glandelinian regime of child slavery. 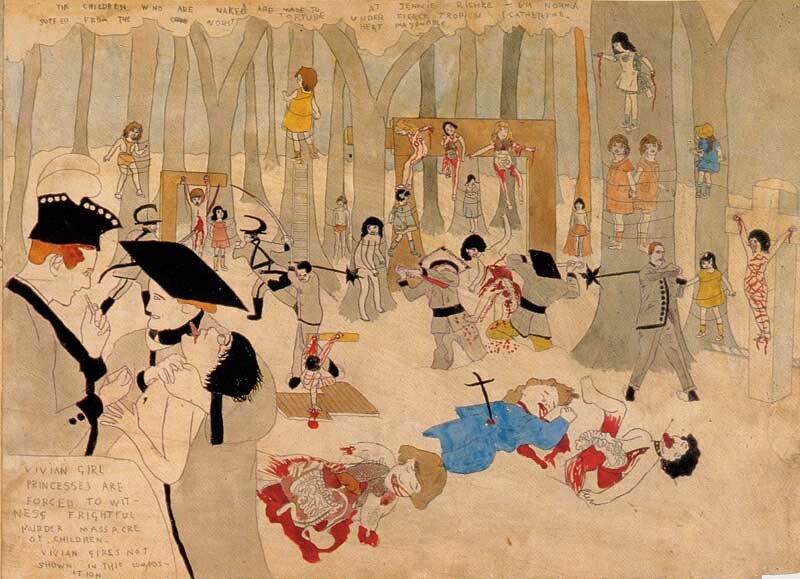 Darger's illustrations were rendered largely by tracing, collage, or photo enlargement from popular magazines and children's books. The sometimes disturbing, but visually brilliant, images often depict wholesome, partially-clothed, children placed in situations of peril, such as battle scenes. This aspect of his art can make Darger's work 'difficult' for modern viewers but Darger's own tragic life and the all-encompassing nature of his devotion to his art should be reason enough for looking beyond the surface strangeness. His life and art certainly seem to resonate with indie musicians. As well as the Vivian Girls obvious homage, indie-folk experimentalist Sufjan Stevens has released a song entitled 'The Vivian Girls Are Visited in the Night by Saint Dargarius and His Squadron of Benevolent Butterflies' on his 2006 compilation album The Avalanche: Outtakes and Extras from the Illinois Album. Griff says: Land Ahoy! It's Columbus & Crusoe. Griff says; Here is the soundtrack!